It was heartening to learn that Bentley, the dog of Dallas nurse Nina Pham, has tested negative for the Ebola virus, and to know that Ms. Pham's condition has also improved. Bentley is still in quarantine and awaiting further tests. To their credit, Dallas authorities, including Dallas Animal Services with help from the Veterinary Emergency Team at Texas A&M; University, have handled Bentley's situation with transparency, care and poise. They avoided the unfortunate scenario that played out in the case of a Spanish nurse diagnosed with Ebola, María Teresa Romero Ramos. Her dog, Excalibur, was euthanized in Spain amidst great protest and with no effort to evaluate his condition. In recent days, as the Ebola epidemic has intensified in West Africa, a number of nations have mobilized to send medical personnel and supplies to Guinea, Liberia, and Sierra Leone, where the need for such assistance is acute. Thousands of people are dead already, often after protracted suffering. And the next few weeks will prove decisive in the struggle to contain Ebola's spread and shore up the medical care systems in these three countries, amongst the poorest in the world. Through Humane Society International, we've supported and worked with animal protection organizations in the region over the years, and we're well aware of their vital contributions to animals in need. These groups have been seriously affected by Ebola's terrible toll on both the human and animal populations in the zone of impact. The crisis has disrupted their normal operations and supply chains, as well as placed many animal care workers at personal risk. Notwithstanding, they are doing their best to carry out needed relief and direct care work. Earlier this week, Humane Society International made grants to two groups working to help animals in Sierra Leone. One of them, Tacugama Chimpanzee Sanctuary outside Freetown, Sierra Leone, has been a vital bulwark against the many threats to wild chimpanzees in that nation, including deforestation, slash-and-burn agriculture, and the illicit pet trade, all of which continue to threaten their survival. TCS has also provided necessary refuge and care to nearly 100 orphaned, abandoned and mistreated chimpanzees in need. 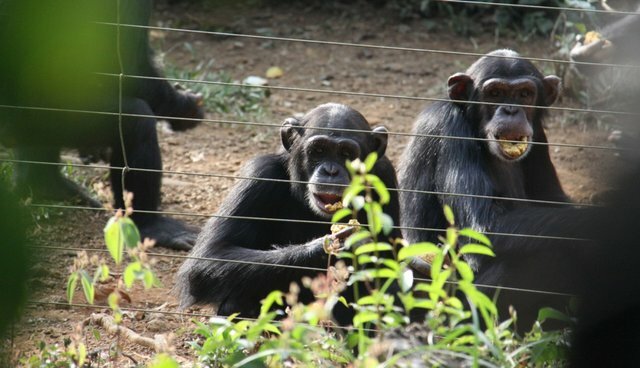 Sierra Leone, once a major exporter of chimpanzees, mostly for research, is now home to an outstanding sanctuary that is actively working in their defense. Sierra Leone and Guinea share an important border zone that provides crucial habitat for chimpanzees, and a few years ago, HSI worked with the Jane Goodall Institute on a successful project aimed at securing greater protection for them. TCS's Bala Amarasekaran and his colleagues are heroes to all of us at The HSUS and HSI. We've also sent emergency funds to the Campaign Against Cruelty to Animals to help bring relief to pets, street dogs and farm animals in need in the stricken West African nation. Together with the Sierra Leone Animal Welfare Society, led by long-time HSI collaborator Dr. Gudush Jalloh, a veterinarian, the CCA-SL is helping to provide food for animals in quarantined homes and villages in the southern part of the country. The two groups have already done so much to support animals and people who care for them, and we're determined to support their efforts in the midst of the current emergency. There is much more to be done in support of the people and the animals in West Africa, as the Ebola virus sweeps through the region, debilitating and killing both humans and animals. As the public health community seeks to halt Ebola's spread, we are continuing to look for ways to support the work of animal protection in the affected areas.